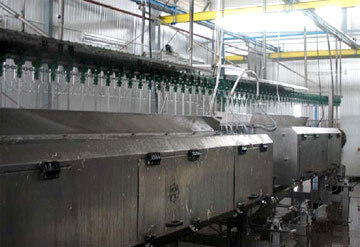 The open design of the system meets the high requirements of the hygienic conditions in the picker. The feathers are gently removed from the carcass by the combination of adjustable plucking bars and water. Plucking banks are single, adjustable in height and obtain an optimum plucking result. The plucking disc is driven by a special drive belt for noise reduction. The machine can easily be integrated into existing lines, thus satisfying every demand on flexible systems for the future. The machine uses two plucking bars on either side. 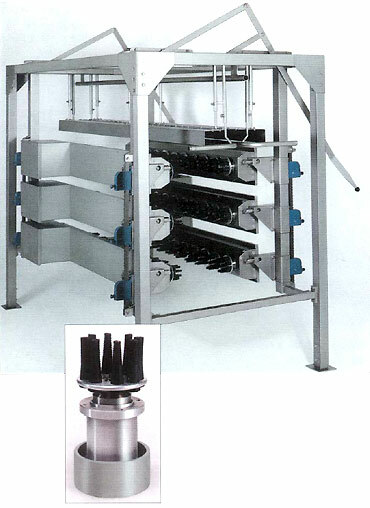 The number of plucking discs on each bar will depend on the plant's capacity. The plucking bars are mounted on a rack so that the feathers can be fed below the plucking area by any preferred method. Easy dismantling of the individual plucking units guarantees user-friendly cleaning and maintenance.